Spicy Cheeseburgers cooked on a barbecue grill topped with sauteed jalapeno and onions. Serve with fruit and 3-bean salad to quench the fire. Place ground beef in a mixing bowl. Add Ranch salad dressing and salsa and mix well. Shape into patties and place on a hot BBQ grill. While one side of the burger cooks, slice jalapeno pepper and onion. Flip burger to brown other side. In a skillet, sauté jalapeno and onion in olive oil. Top burger with cheese and continue cooking until cheese melts slightly. 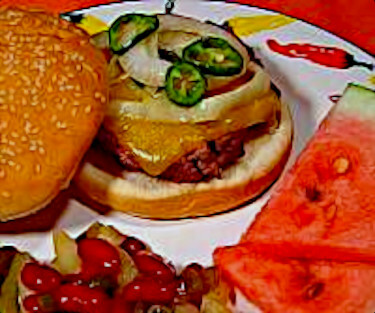 Serve burger on a bun, top with sautéed jalapeno and onions. Add prepared 3-bean salad and fresh fruit to help put out the fire!